Vancouver based customizer might have just made the sweetest looking OMEN ever! 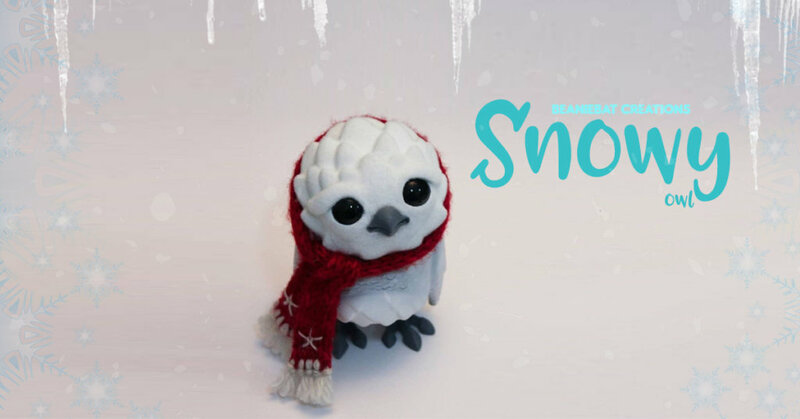 Robyn of BeanieBat Creations presents to you “Snowy Owl” oh, god the innocent looking eyes and text won our hearts so much so we wanted to hug the little chap when we saw Snowy Owl. We love everything about Snowy Owl, from the sculpted beak to the lightly flocked finish all the way to the simple colour scheme. Robyn is all set to showcase”Snowy Owl” at Clutters Gift Wrapped 2018 group show. To celebrate the 6th instalment of our annual Gift Wrapped exhibition we have gathered over 100 amazing artists to bring you affordable art just in time for the holidays!! Gift Wrapped is a special holiday season (not holiday themed) art exhibition designed to encourage people to buy unique, hand-made, artist-driven gifts for the holidays. A favourite here at Clutter, the show features a mixture of 2D, 3D, wall hanging and standing pieces, in all genres of the designer toy and contemporary art world. Each piece in the show has a maximum retail price of $200, and unlike our usual exhibits, all sold pieces will be able to be taken home on the night of the opening [cash and carry style] (or shipped shortly thereafter). This is a perfect opportunity to get a unique gift for someone special or a little something for yourself. The opening reception will take place on Saturday, Dec 8th, 2018 (as part of Beacon’s Second Saturday art walk) and all pieces will remain on display until Friday, Jan 4th, 2018, unless purchased. Pieces made for this exhibition will be available for sale both the physical location in downtown Beacon, NY and on our website www.cluttergallery.com. Absurdery • aica • Ally Burke • American Gross • Ari • Bakkun • Beanie Bat • Bibs Lovelypam • Bleeding Edges • Blurble • Bog x Squad • Brent Nolasco • Burning Monster• Candie Bolton • Charles V. Bennett • Chima Group • Concrete & Bone • Creature Hut • Czee • DROLDN • Droolwool • Ears & Dears • Ebb N Flow • Eimi Takano • El Hooligan • Elena Kazi • Erica Borghstijn • Faunwood • Filthbucket • Fluke • FLuX • Frank Mysterio • Freshtoast • Gathabert! (Bert) • Grace Lang • Grape Brain • Grizlli Atom • Grumble Toy • Guumon • Heather Hyatt • HungryGhost • HUSKYx3 • Infinite Rabbits • Irene Brambilla • Javier Jiménez • Jay stelling • Jay222 • Jaykblu • JCORP • JeAA • Jellykoe • Jeremiah Ketner • Johnny Draco • Katie Gamb • Kelly Denato • Kendra’s Customs • Kikkake Toy • KKAMoxo • Klav • Kyle Kirwan • Lana Crooks • Lapka • Leather Monsters • Lisa Rae Hansen • Melissa Sue Stanley • Mike Strick • Misfit Menagerie • Miss Little Zombie • Mizna Wada • MJ Hsu • MP Gautheron • Mr Mars Studios • Mr.Mitote • Mumbot • Mus Musculus • Nick Nightmare • OEO Toys • One Eyed Girl • ONORIO D’EPIRO • Pickled Circus • Psycho Scimitar • Rampage Toys • RunDMB • Sad Salesman • SaoZen • Scribe • Seulgie • Shannon Knight • Simon Says Macy • Stacia Murphy • Steve Ferrera • Stitch of Whimsy • Tasha Zimich • Task One • The Beast Peddler • The Bots • Tim Clarke • TOiNZ • Umarts • Vanessa Ramirez • Venetta Butcher • We Are Frilly • Wetworks • Zard Apuya • Zieromuko & MORE! Some come along, check out the amazing pieces on display, and sip some festive cheer from our friends at Lagunitas! Find Robyn on Instagram and Facebook.